“There has been one meeting (on this). It is a matter of setting up the governance structures. Now ball is in the court of the Indian side to finalise the governance of the setting up of the fund. We are ready for it,” the UAE ambassador Dr Ahmed Al Banna said. The United Arab Emirates has attributed the delay in setting up the $75-billion UAE-India Infrastructure Investment Fund to New Delhi’s failure in putting in place the necessary governance structures. The UAE is keen that New Delhi should speed up the process and has also shown interest in an open-sky policy in aviation, and an improved bilateral investment agreement. Prime Minister Narendra Modi’s visit to the UAE in August 2015 was a watershed in many ways, and not just because Modi was the first Indian PM in 34 years to have visited the UAE, which is one of India’s biggest trade and investment partners. That visit raised India-UAE ties beyond trade to the level of strategic partnership. It also led the UAE to agree to set up a $75-billion UAE-India Infrastructure Investment Fund to support investments over a 10-year period in India’s infrastructure sector. The focus of the fund will be roads, railways, ports, airports, and industrial corridors and parks. But there is little forward movement in setting up the fund nearly 18 months after the PM and the Crown Prince of Abu Dhabi Sheikh Mohammed Bin Zayed Al Nahyan’s had signed the memorandum of understanding. The two leaders had re-iterated their intent to set up the $75-billion fund when the crown prince visited India in February 2016. The crown prince lands in New Delhi on Tuesday for a three-day State visit, and he will be the chief guest at this year’s Republic Day parade. The UAE’s ambassador to India Dr Ahmed Al Banna on Monday said the two sides will sign 13 agreements, covering several sectors from counter-terrorism to strengthening economic ties, during the visit of the crown prince. The highlight will be an agreement to institutionalise a biannual strategic dialogue between the two foreign ministries at the minister of state level. Its first meeting is scheduled for September 2017. On the UAE-India Infrastructure Investment Fund, the Ambassador said that India has only recently appointed the chief executive officer to its National Investment and Infrastructure Fund. “There has been one meeting (on this). It is a matter of setting up the governance structures. Now ball is in the court of the Indian side to finalise the governance of the setting up of that $75 billion fund. We are ready for it,” the UAE ambassador said. Dr Al Banna said India and UAE will strengthen their counter-terrorism cooperation during the visit of the crown prince, but dismissed reports that the Emirates has frozen property and other assets of one of India’s most wanted terrorists, Dawood Ibrahim. He said there was “no basis” to these reports. The crown prince will be accompanied by an economic as well as a “tolerance” delegation. The UAE has special ministries for tolerance, happiness and future. The ambassador said the delegation will meet its counterparts here and talk about how the Emirates was home to 200 nationalities living peacefully. He said the UAE wants to showcase that it’s a modern country and respects all religions. The ambassador said the UAE has always condemned terror attacks on India, and is committed to eradication of terrorism and extremism. Currently, India and UAE have a $350 billion bilateral trade, which the two plan to increase three times in the near future. After China and the US, the Emirates is India’s largest trading partner. 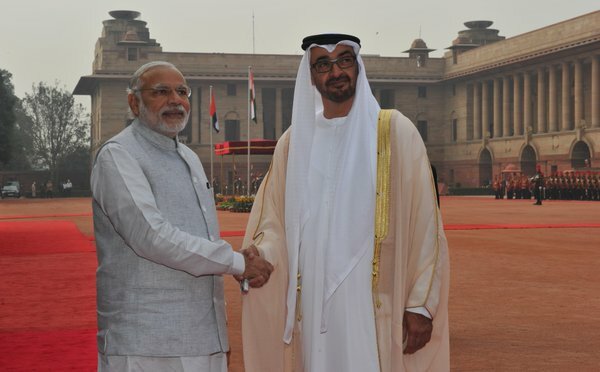 In the last one year, UAE investments into India were $10 billion, including foreign direct investment of $4 billion. As many as 2.8 million Indians that work in UAE sent remittances worth $13.8 billion back home. A whopping 1070 flights operate between UAE and Indian airports per week, of which 580 are operated by Indian carriers and the rest by UAE carriers. The two sides inked a revised air services agreement recently, but the Ambassador said the UAE hopes to reach the ‘open sky policy’ with India. He said the bilateral investment agreement has been revised but the Emirates looks forward to an improved agreement. On the ‘e-Migrate’ system launched by India for recruitment of Indian workers in the UAE, the ambassador said an expert team was looking into the issues involved, and the UAE feels that some aspects of it impinge on its sovereignty. The ambassador said issues will soon be sorted out.